Kate Di Prima - Dietitian: Sunday morning breakfast..................bliss! There is nothing more than relaxing with the paper and a yummy Sunday morning breakfast that is healthy, quick, easy to prepare and guaranteed to be eaten by everyone in the family. Yes there is such a meal......French Toast. The popular history behind French toast (aka German toast, American toast, Spanish toast, Nun's toast, Cream toast, Amarilla, Poor Knights of Windsor) is that it was created by medieval European cooks who needed to use every bit of food they could find to feed their families. They knew old, stale bread (French term "pain perdu" literally means lost bread) could be revived when moistened with milk and enriched with eggs. The traditional method of cookery was on a hot griddle prepped with a little fat (butter, oil). Quite like today. High in protein, iron and low GI this is a great breakfast to start the day and give little engines the boost they need. 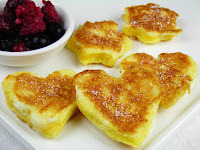 *For savoury French toast add grated cheese to the egg mixture and instead serve with a drizzle of tomato sauce.